Travelling on the CityLink motorway you will pass under 39 large red poles and an enormous yellow pillar tilted over the traffic below. 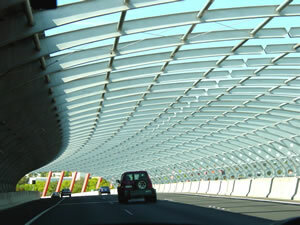 The 70-metre yellow steel beam and the accompanying 39 red "sticks", frame the freeway's city exit in Flemington are officially called the Melbourne International Gateway. The yellow pillars represents the Victorian Gold-Rush and the red poles represents the Wheat Industry of Australia. The features were designed to create a frame for the City of Melbourne to feel like we are passing through a Gateway to the City. When CityLink opened, its architects, Denton Corker Marshall described the yellow beam as "the urban equivalent of the universal yellow boom gate in the up position". Melburnians call the gateway the Ribcage* and Cheesestick. *Also Zipper. A little further south of the gateway is a huge tube structure built over the roadway, designed to reduce noise pollution to nearby housing. Tube tunnel has its own nickname, having become known locally as 'Jeff's condom' after Jeff Kennett, the state Premier when the humungous sheath was built. You absolutely must see the sound tunnel at night. We drove through it in November 2017 and loved the amazing new multi coloured lighting scheme. The gateway can be seen live on the CityLink web cam. Look for the web cam to the left of Melbourne Zoo (C6 - lower left side). The East West Link is to be an 18km freeway connection extending across Melbourne, from the Eastern Freeway in Collingwood to the Western Ring Road in Sunshine West. It will create a direct cross city connection. The East West Link plan will see new overpasses and tunnel entrances that may require the Melbourne International Gateway to be moved. The 'Cheese Stick', a 70 metre yellow steel beam that welcomes traffic into Melbourne, could be shifted approximately 80 metres north.